we have now entered the sacred window that only comes once a year, between Beyoncé’s birthday today and my own on the 6th. any money given to me will just be more taxes to pay later. 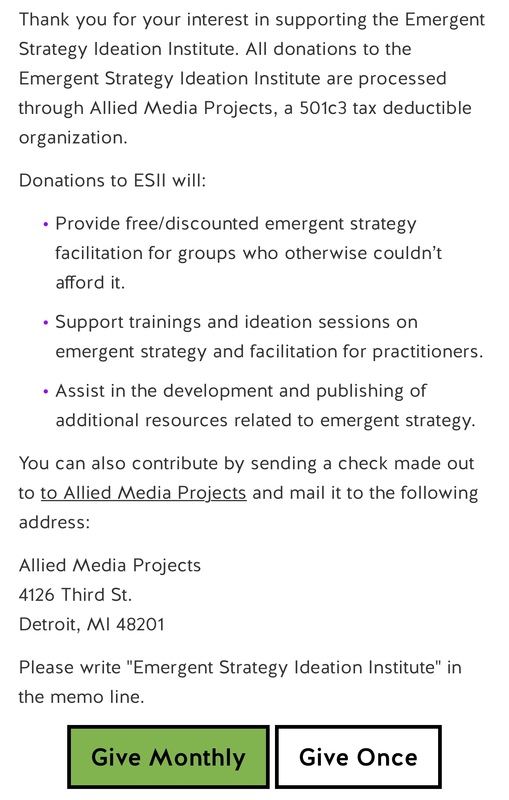 but what really matters to me is supporting and protecting the work of the Emergent Strategy Ideation Institute. i don’t want the work to drift because i’m being made to feel scarcity. i’m feeling clearer than ever that it’s time to offer emergent strategy facilitation training, i want to answer this call. monthly or one-time donations to make sure that this budding little institute can actually cover my salary, let me hire someone brilliant to grow the work, and let us focus on making the offer of facilitation training for 2019, this is the birthday gift i want. if you have been moved by emergent strategy, by the thinking and writing and facilitation, if it can come from the heart, please give. in the memo put “ESII birthday donation” so i can thank you all for being my birthday blessing.